Conservators love gold! Not only can it be worked with ease through a variety of processes to make beautiful artwork and jewelry, but it also never tarnishes or corrodes…not in 50 years or 5000 years – NEVER! When Queen Puabi’s headdress (ca. 2450 BCE) was excavated in the 1920s by Sir Leonard Woolley, her golden adornments were gleaming just as brightly as ever. You can learn more about Queen Puabi and her amazing treatment history here, and in the new Middle East Galleries. 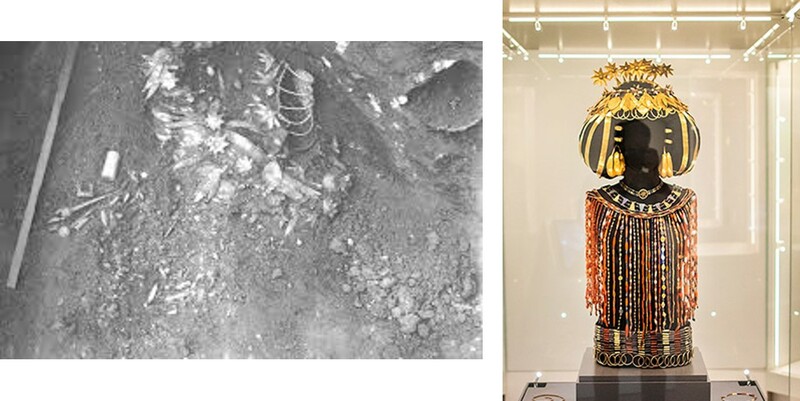 Left: In situ image of the headdress of Queen Puabi, excavated by Leonard Woolley in the 1920s. 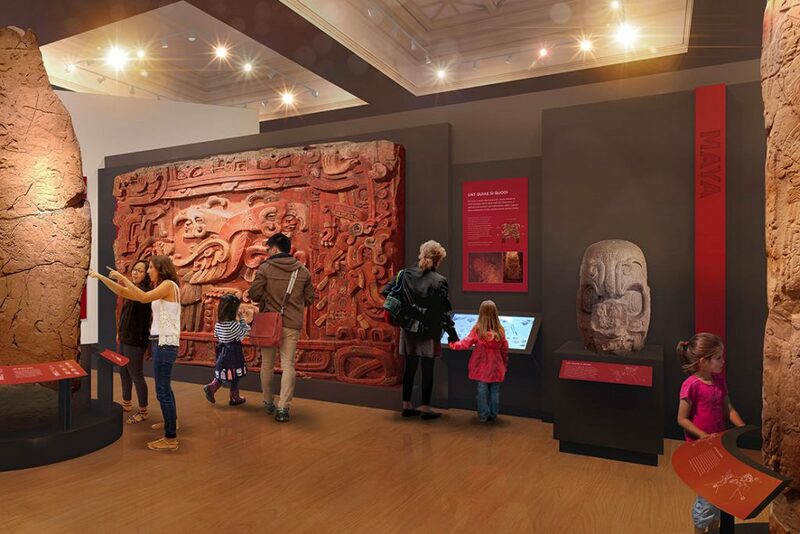 Right: Puabi’s headdress on display in the new Middle East Galleries. 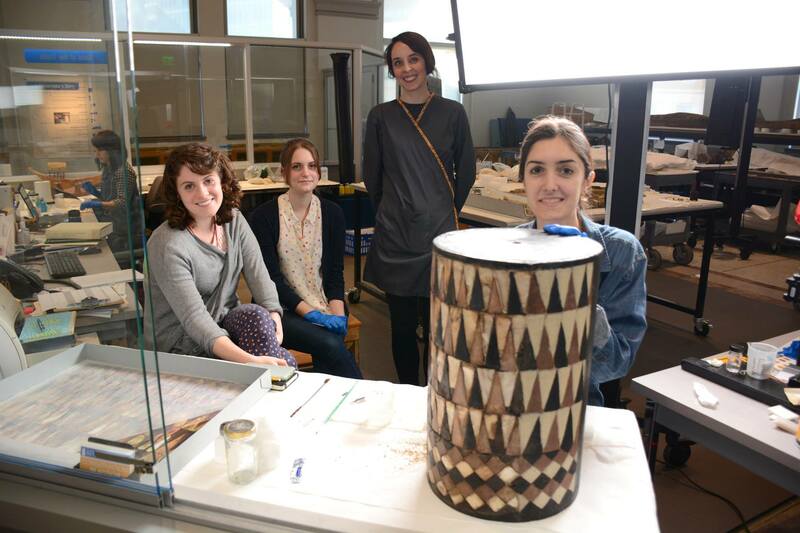 In the past few weeks, the Conservation Lab has been shimmering with gold. 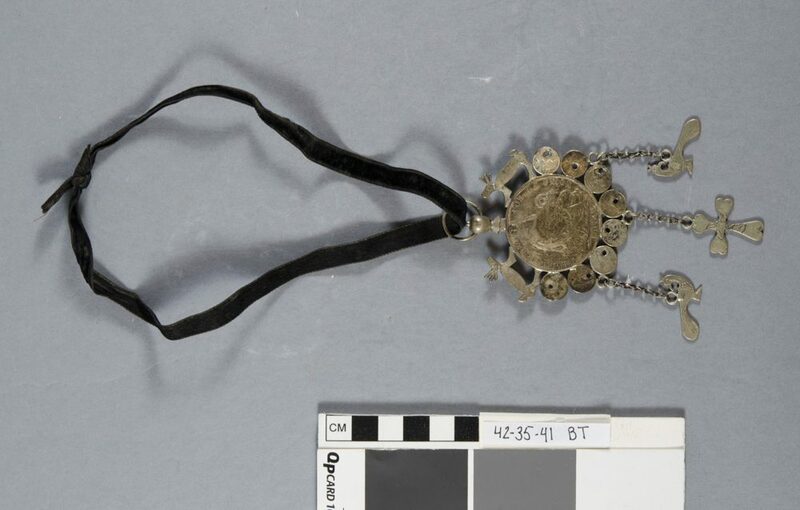 Williams Project Conservator Alexis North is preparing for the upcoming Mexico and Central America Gallery, treating gold pendants and ornaments. As a material, gold has virtually no inherent vices: it will not deform or crack with changes in relative humidity or temperature, nor will it discolor with age or UV exposure… it’s as stable a material as a conservator could ask for! According to the American Institute for Conservation’s Wiki gold entry, “Under normal conditions, [ ] gold is incredibly stable and is more often susceptible to damage from mechanical pressures (scratching, distortion, etc.) 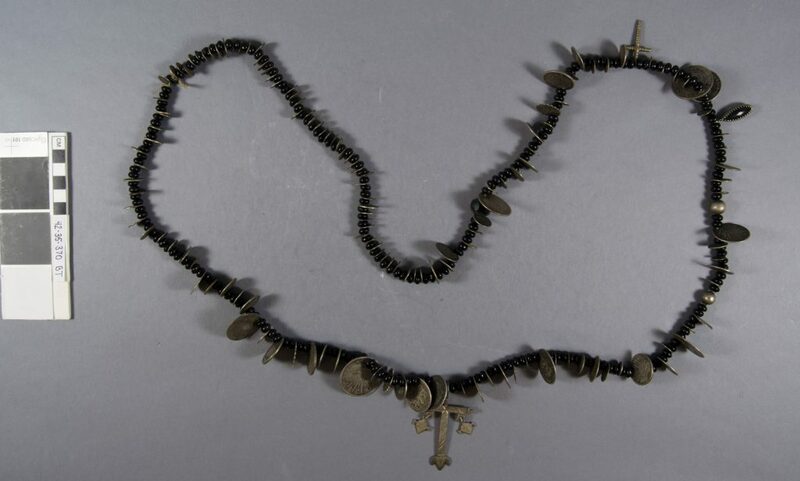 rather than corrosion and other chemical processes.” Since conservators spend considerable amounts of time preventing and treating corrosion of less stable metals, the chance to work with largely inert gold objects is very exciting. Despite it’s notorious stability, each gold object was carefully documented and assessed for condition issues, as with everything that comes through the conservation labs. For most gold objects, the only treatment necessary is a brief campaign of degreasing with ethanol on cotton swabs. For others with thin and pliable areas, such as the back right foot of the golden frog ornament pictured above, external forces exerted on the material may cause stress cracks, potentially culminating in a break. Where cracks are seen, mends with toned Japanese tissue may be applied, creating inconspicuous band-aid-like fixes. After these quick treatments, the objects can often be returned to storage by the end of the day. However, not all that glitters is entirely gold. Because gold is such a soft and expensive material, many “gold” objects are composed primarily of a harder and less expensive metal with just a thin layer of gold at their surface. There are several processes used to achieve this look. A number of the gold objects in the upcoming Mexico and Central America Gallery, including the golden frog ornament above, were manufactured using the technique of depletion gilding. Additional methods of gilding may be used to adorn metal or wood surfaces such as water gilding, oil gilding, acrylic gilding, or mercury gilding. Another method for achieving the look of gold while reducing the cost or fragility, is by creating alloys (mixtures) of gold and other metals; a common example is white gold, which is composed of gold and nickel, palladium, platinum, and manganese. The inclusion of other metals in a gold alloy alters the properties of the gold, and may increase the hardness of the final material. However, the presence of non-gold metals in an alloy will predispose the material to tarnishing and discoloration. 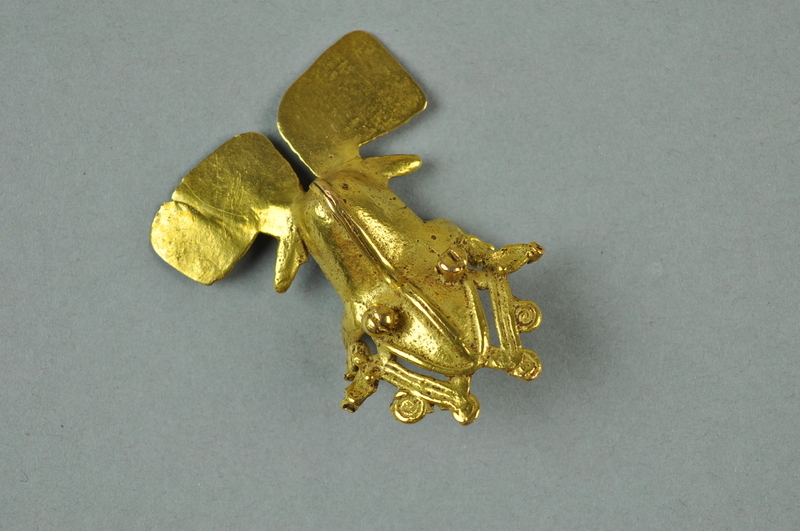 To learn more about gold in Central America, check out this piece from the Metropolitan Museum of Art. There are a few new objects on display in the Artifact Lab this week, which give visitors a glimpse of upcoming changes in the museum. 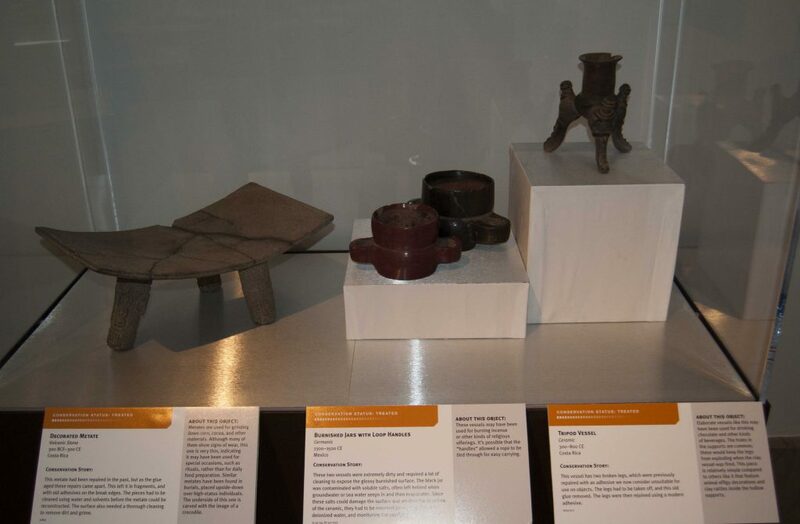 These 4 pieces were recently conserved in the Artifact Lab to prepare them for installation in our forthcoming Mexico & Central America Gallery (from left to right: a stone metate from Costa Rica 11819, two burnished ceramic jars from Mexico 31-41-34 & 87-42-1132, and a ceramic tripod vessel from Costa Rica 2013-11-1) . 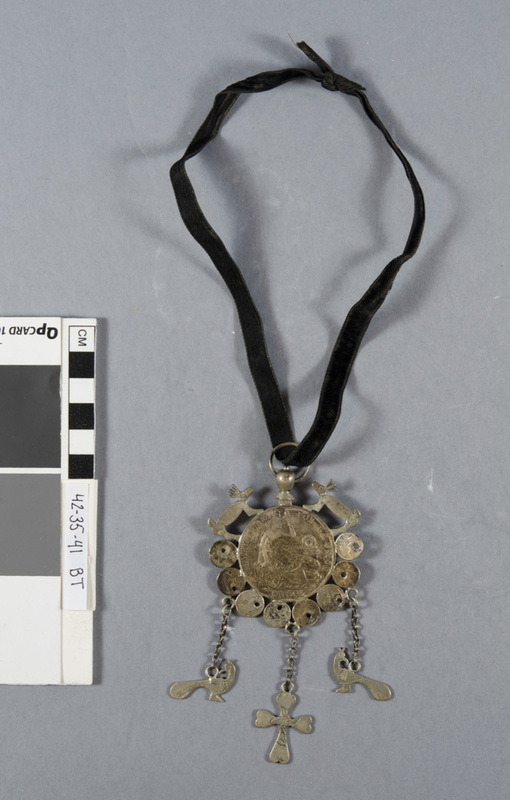 You can see many other objects that will be going into that gallery, both on display in our current Mexico and Central America Gallery as well as being worked on in the Artifact Lab. Artifacts currently being treated in the Artifact lab. On November 1, our Museum announced the commencement of our Building Transformation campaign, a monumental project which will include a full renovation of our building structure and reinstallation of many of our signature galleries, including our iconic Egyptian Galleries. The first glimpse of this work will be the opening of our Middle East Galleries in April 2018. This is not news for readers of this blog – you have been hearing about the conservation work for this project for awhile now (for reference, see these related blogposts). In fact, you can get a glimpse of several exciting projects that are underway for our Building Transformation right now, on a daily basis, in either of our 2 public conservation labs. 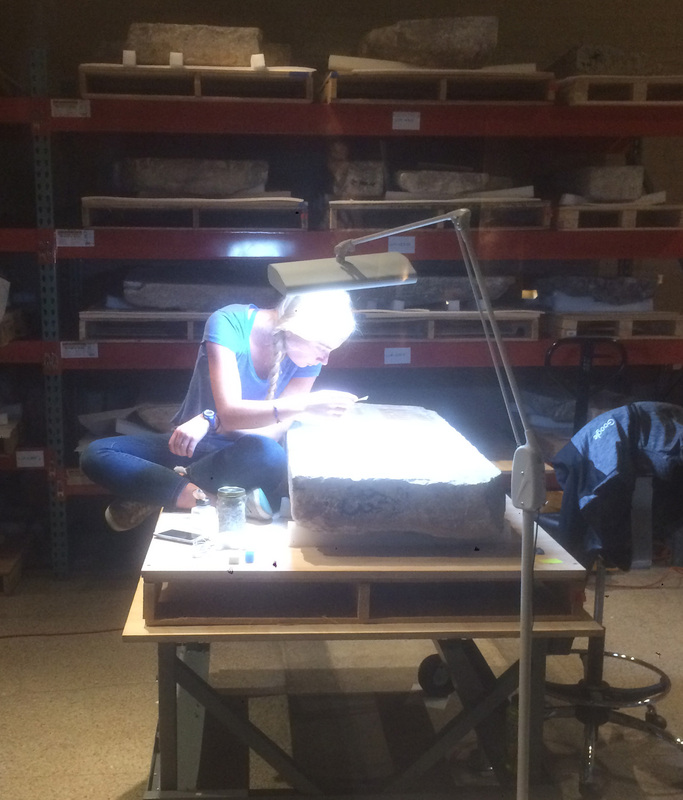 In the Artifact Lab, you will mostly see objects being conserved for the Middle East Galleries and for our Mexico and Central America Gallery, opening in November 2018. 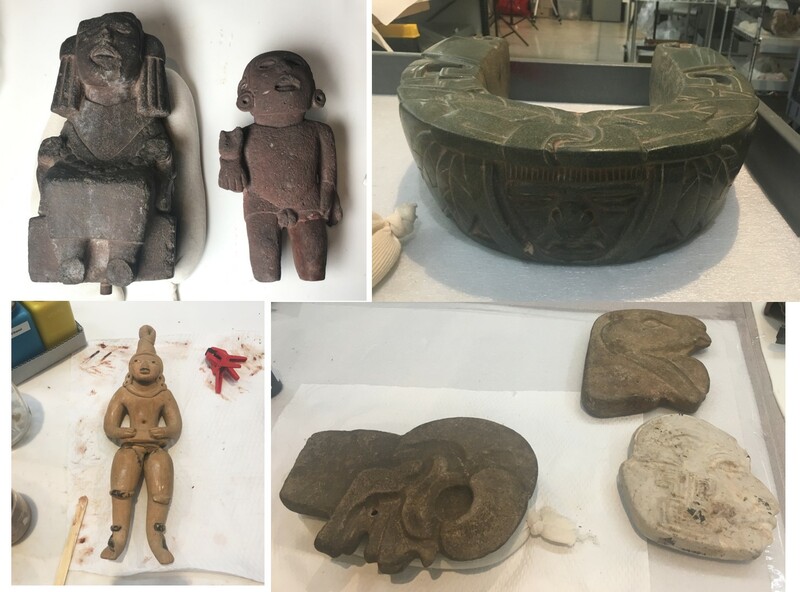 An assortment of artifacts for the Mexico and Central America Gallery in various stages of conservation treatment. 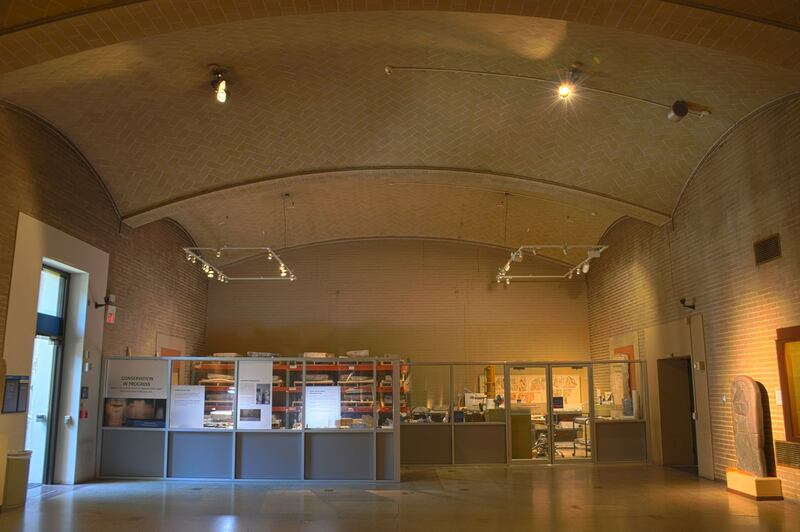 Our other public lab is down in our Lower Egyptian Gallery. Work in that space is dedicated exclusively to conservation treatment of the carved and painted limestone blocks from the Old Kingdom tomb chapel of Kaipure. 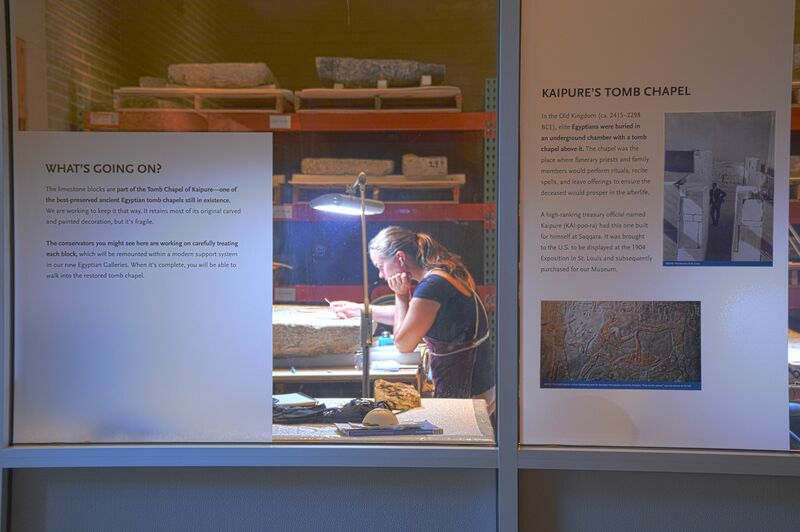 While you can watch the conservation team at work most days in the Kaipure lab, unlike the Artifact Lab, it does not include open window sessions. But have no fear – the Kaipure team has promised to write some blogposts about aspects of their work, so stay tuned for more information on this project! Big projects like the Building Transformation campaign come down to a lot of little details, and no one knows details like the Conservation Department. 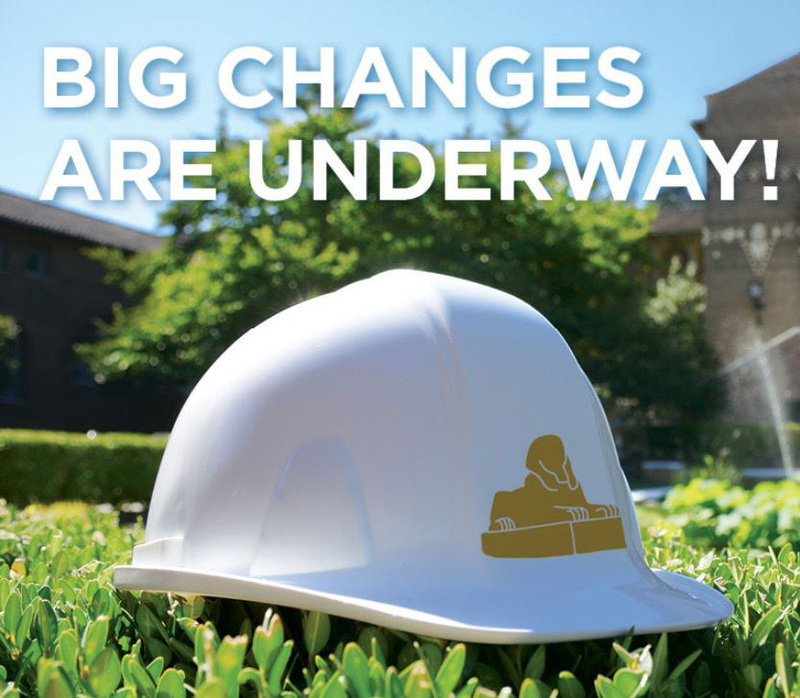 We hope you visit us to learn more about these details, and all the work underway to make these big changes possible. To learn more about the vision of our Building Transformation, check out this ~3 minute video which captures the grandeur of the project (and features Project Conservator Tessa de Alarcon! ).